Bolinfest Changeblog: All Chapters Drafted! This past week, I published a new update to my book-in-progress, Closure: The Definitive Guide. This update includes new chapters on the Closure Inspector and Closure Templates, which means that now every chapter has been drafted, so if you have been holding off on subscribing to the book because you thought the Rough Cut was "too rough," now you no longer have an excuse! Though there are admittedly some sections that are still marked TODO, such as the section on "mocks" in Chapter 15 on the Testing Framework. There are also some sections that are mentioned in the text but lack a reference because they have not been drafted yet, such as the one on creating multiple modules with the Compiler and understanding line joining in Closure Templates. (Though the latter is explained in the online documentation.) Although I have my own punch list of things to add, please feel free to add comments on the Safari books page, as the feedback I have gotten there so far has already proved useful! There is also a striking difference of the slope of the lines in the blue and white sections, though what you may find even more curious is the discontinuity in the blue section. That's because I decided to try working in finance, and after seven weeks, I decided that it wasn't for me. It was actually a great company with incredibly sharp people, but I just couldn't get excited about the problems there as I could for the ones in building Web applications. I got a new job at Yext, which is a much better fit for me. I realize the home page of Yext does not look like much, but I think that this TechCrunch article tells the story better than I can. 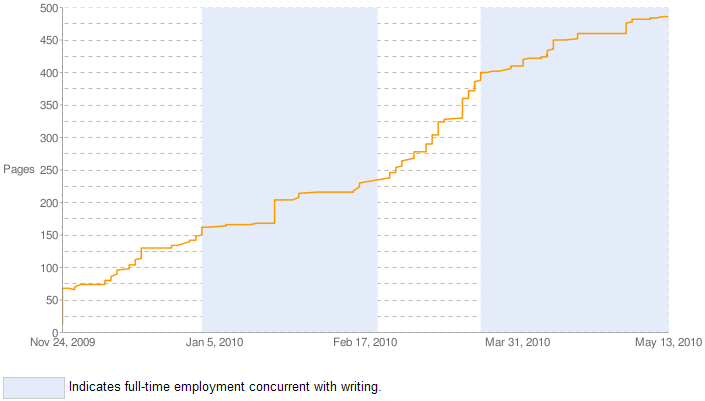 Fortunately, Yext has been very supportive of my book, so I was able to take a bit of time before starting to focus on writing, and as you can see from the graph, it has really paid off! 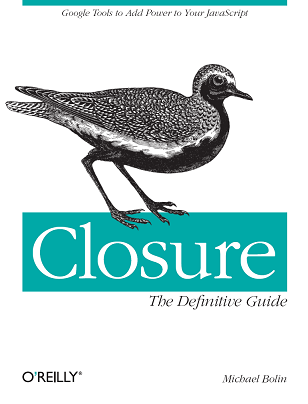 Clearly, working at a startup has slowed my rate of progress, but it has given me more experience training engineers (who have never worked at Google) how to use Closure, so I think The Definitive Guide will be a better book in the long run because of it. Although now that I'm about to enter the revising stage, I think a real sign of progress will be when the line on the graph starts to go down, because as Blaise Pascal (apparently not Mark Twain) said: "I have only made this [letter] longer, because I have not had the time to make it shorter."